A three-quarter length portrait of a youth wearing white shorts and neck ornaments, against a woven grass fence backdrop. 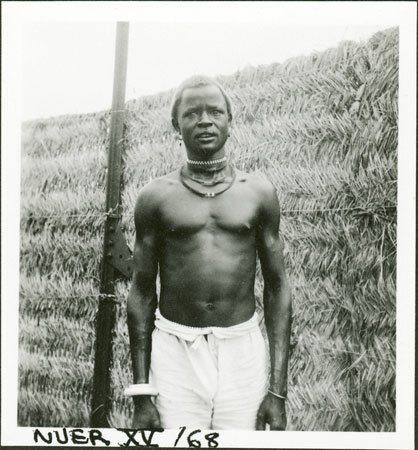 Evans-Pritchard notes that this youth is half Anuak and half Nuer, which probably accounts for his interest in taking a physical anthropological image of him. In other images it is clear that this was a courtyard fence at a mission or government property, most likely at Nasir. Note on print reverse ms pencil - "04 3" & print front border ms ink - "NUER XV/68"
Morton, Chris. "Anuak-Nuer youth" Southern Sudan Project (in development). 03 Jan. 2006. Pitt Rivers Museum. <http://southernsudan.prm.ox.ac.uk/details/1998.355.734.2/>.